SoundSpectrum's visuals are offered as a plug-in for audio players such as iTunes and Windows Media Player, but they also run as a standalone application that can visualize any audio source that your computer makes available. Our standalone application documentation describes how to set this up in detail. SoundSpectrum Audio Cable is a Windows sound extension bundled with SoundSpectrum’s Platinum products, allowing system audio to be looped-back to a standalone application running our visuals. In effect, audio from any program or web browser can be visualized using G-Force, Aeon, or WhiteCap Standalone. This means you can visualize any audio you like on a Windows system. If you’re using macOS, your only option is to install a third party application such as Loopback by Rogue Amoeba. In Windows, open Control Panel / Sound (or search for "Sound"). Right-click on Stereo In and select Set As Default Device. Right-click on Stereo Out and select Properties. Near the bottom, select Use this device (enable). Check the box Listen to this device. Under Playback through this device, select your desired playback device/speakers. Press the "OK" button (closing the Properties window). Press the "OK" button (closing the Sound window). Restart the Standalone Application and change the audio source to Stereo In. 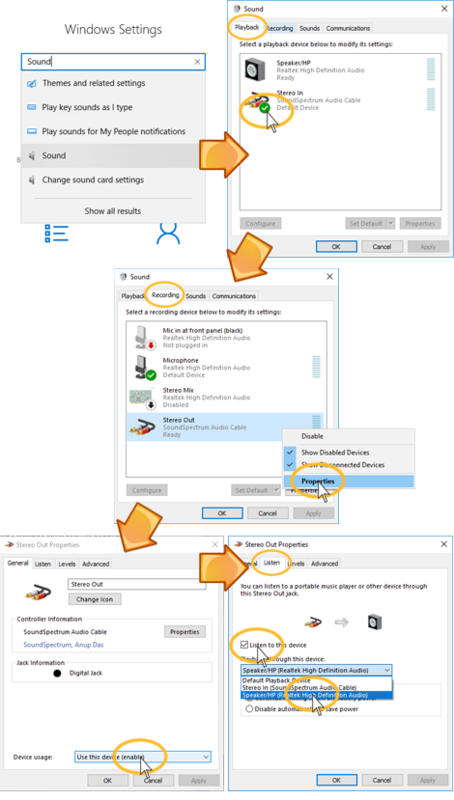 Follow the above steps to set up SoundSpectrum Audio Cable on Windows. You have done the one thing I’ve aspired to create in many decades. As an artist, musician with perfect pitch, your software is the missing component in the gift God gave me. I love it and I love it! Thank you for the brief moments of beauty you brought to my life. I just wanted you to know how much I appreciate talents such as yours. My best to you.